• what it takes to prevent hydraulic problems. As you've probably guessed, we provide that kind of training - training focused on downsizing your hydraulic-related downtime. 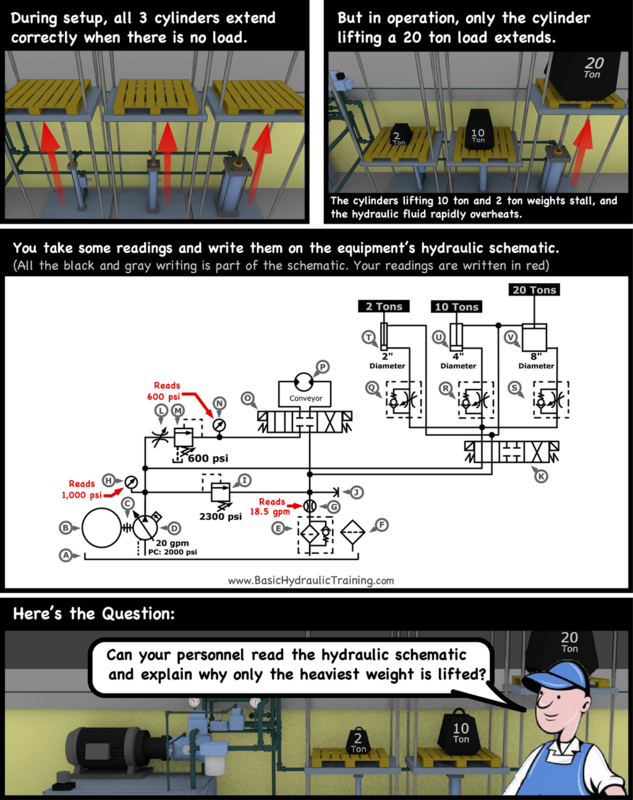 3) Getting the best possible performance from your hydraulics. And, to make the training even more valuable, one of your hydraulic schematics can be integrated into the training so part of the training is spent working with your hydraulic schematic and your hydraulic circuit. There's a good chance you're reading this page because you want to help your maintenance personnel do a better and faster job of troubleshooting hydraulic problems. And there's also a good chance you've been thinking about getting some hydraulic training for a while, but it hasn't been a real high priority. The thing is, some kinds of hydraulic problems damage the internal parts of your hydraulic components. That damage generates contamination, and that contamination almost always causes more problems down the road. The longer you wait to provide your personnel with basic hydraulic training, the greater the chance of having more hydraulic problems down the road. What's the reason for this hydraulic problem, and how would you fix it? More importantly, how would your maintenance personnel troubleshoot and fix this problem? • show you why it might be a good idea to consider using a separate pump to drive the conveyor. 1) Start by contacting us. Either click a Schedule Training button, or call Rob Fish at 614-214-7261614-214-7261. 2) After we discuss your training needs, we'll email you a proposal for 1-day, 2-day, and 3-day training sessions conducted at your facility. 3) If you'd like one or more of your schematics included as an integral part of the training, you'll send us the schematic(s). 4) We'll conduct the training at your facility.